Have a look at the gun above. It’s an M1911 pistol, the standard issue sidearm for the United States Armed Forces for nearly a century. The semi-automatic weapon can hold up to 11 rounds and fire as fast as one can pull the trigger. And that specific gun above, it was made with a machine you can buy on the internet. It is virtually untraceable. 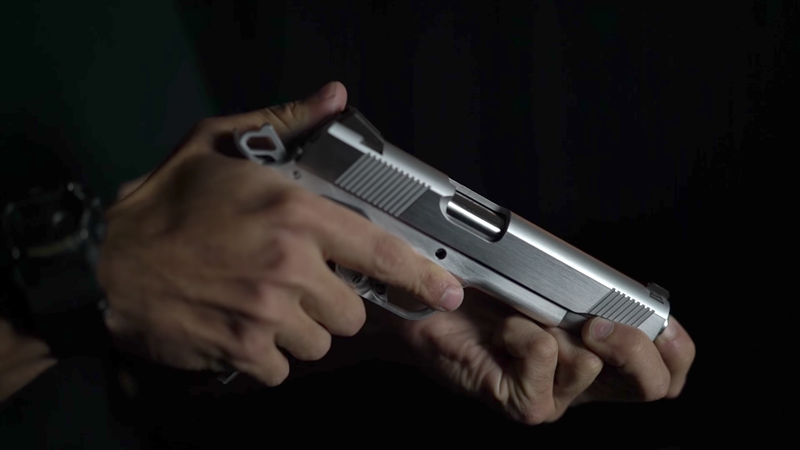 This and similar handguns can now be built with Defense Distributed’s Ghost Gunner computer-controlled milling machine. As first reported by Wired, the company just announced a software update for the three year-old, microwave-sized machine that lets anyone plug in a USB stick, install an unfinished aluminum frame bought without regulatory oversight from a vendor, and produce a handgun frame in a matter of hours. Once you attach components like a barrel and firing pin—also unregulated—that frame becomes a fully operational firearm that fits into the the waistband of Levi’s jeans. The gun is untraceable, since there’s no serial number and possibly no record of it ever being produced. Scary, right? In the wake of Sunday night’s mass shooting in Las Vegas, the deadliest in modern American history, plenty of people are wondering how the United States will react to yet another possibly avoidable gun-related tragedy. That mass shooting involved 64-year-old Stephen Paddock opened fire on a country music festival with an automatic weapon, killing at least 58 people and leading to at least 515 injuries. According to his brother, Eric Paddock, the shooter was “not an avid gun guy at all,” and yet, police found multiple rifles and assault weapons in the Mandalay Bay hotel room from which Paddock mounted his assault. It’s so far unclear how he got the guns, but it’s deeply disturbing that anyone could amass such an arsenal and use it on unsuspecting civilians. As the frightening innovation in the Ghost Gunner machine’s capabilities make clear, it’s becoming frightfully easy for anyone to build a gun in their own home. The device comes from Defense Distributed, a company founded by Cody Wilson, a complicated figure who won fame after building the what’s believed to be one of the world’s first 3D-printed guns over four years ago. That awkward plastic device could only fire one round and attracted attention from both Congress and the Bureau of Alcohol, Tobacco, and Firearms (ATF), since it could potentially evade detection by conventional metal detectors. In 2014, however, Defense Distributed raised the stakes, when it released the original Ghost Gunner. This CNC mill was capable of producing the lower receiver of a death-ready AR-15, the only regulated piece of hardware on the gun. The rest of the rifle’s parts could be easily purchased from a variety of sources without pesky regulation getting in the way. The process is so easy, Wired’s Andy Greenberg built an untraceable AR-15 in the magazine’s offices. Greenberg had never built a gun before and is not even a gun owner. In other words, it’s slightly harder to build a handgun than it is to build an AR-15, a favorite gun of mass shooters in America. Nevertheless, any committed would-be gunsmith can presumably figure it out. The fact that the latest Ghost Gunner machine can mill handgun frames is a natural evolution of this libertarian dream. In the United States, where gun control remains a hotly contested issue, some worry that the government could one day make it very difficult to obtain firearms. In that future world, some might exercise their constitutional right to bear arms by building guns of their own, and technology like the Ghost Gunner makes this task incredibly easy. Under the Second Amendment, it’s legal for American citizens to build their own guns at home, although state and local laws regarding registration vary. Last year, in the wake of Defense Distributed’s efforts to offer easy-to-use gun manufacturing technology, California passed a “ghost gun” law that required amateur gunsmiths to obtain serial numbers for firearms they produced. The NRA is currently challenging the new law in court. There’s currently no federal legislation banning the manufacture or sales of ghost guns, and Congress doesn’t seem eager to take up the issue. That’s putting it lightly. The Ghost Gunner machine is not cheap at $1,675 per unit. It’s also not possible to download the plans to build a handgun directly from the web, thanks to a 2013 State Department regulation. Defense Distributed will mail out USB sticks loaded with the software at its customers’ request. Even then, the machine is not designed to build a gun from scratch. You’ll need a part—a lower receiver for the AR-15 or a frame for a handgun—that’s 80 percent complete in order to avoid regulation. The Ghost Gunner will do the rest of the work, and then you just have to snap the barrel, trigger, pin, and other components into place. Again, all of these can be freely purchased without any regulatory oversight. This in mind, it’s hard to imagine who exactly would want to build an untraceable handgun (or rifle) in the privacy of their own home. Libertarians hobbyists? Sure. But then you also have to consider those who can’t buy guns legally, perhaps due to a criminal record or a history of mental illness or simply a disdain for the process that some believe inhibits would-be gun owners from gaining access to guns. In a country struggling with gun violence, however, the mission to get guns into more hands, to get triggers behind more fingers seems unsettling. Here’s the bottom line: Defense Distributed has reportedly sold thousands of its Ghost Gunners, and the machines produce weapons that are functionally indistinguishable from those used in mass shootings and on the streets. They’re just as deadly as the guns people buy from dealers or on the black market, and they’re arguably easier to get. We’ve reached out to Cody Wilson and Defense Distributed to learn more about the company’s latest technology. We’ll update this post if we hear back.